Get more for your wedding! 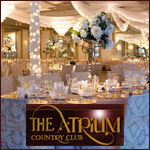 Don't forget to mention ChossonKallah.com when visiting The Atrium Country Club. Had my daughter's wedding there yesterday. Overall, they did a great job, we had no complaints. In fact, we had many, many guests compliment us on the whole affair. The food was very good and plentiful. The facility was beautiful. Great job by the staff and management.